Yesterday, I took a direct hit. I couldn’t address the wounding in the exact moment due to my shock, but bandaided myself in a stop gap measure as best i could and carried on. 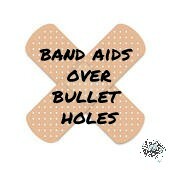 A bandaid isn’t an effective treatment for a major wound, is it? As soon as I got some time alone, i ripped off the bandaid, and asked God to pour His healing into the situation. This morning, I am feeling like the bullet has been removed. But the situation isn’t rectified yet. You see, I can forgive, but i can’t move on until the shooter has heard what they did. For me, its not about justice, but honor. The shooter was someone i respect, a fellow believer. And when they get stressed out, they sharpshoot before taking a step back to take in the whole situation. I get it, because my temper flares too. God and i have spent years working on my giving my anger over to Him, and not responding in the moment it hits. I need to wait for the feelings to simmer so I can hear His voice telling me what to do when i have been hurt. You’ll note, I am not talking about being offended, but wounded. If i take offense at what someone does to me, I sharpshoot myself in the process. If and when i am wounded, whether by a friend or enemy, I am called to forgive. I am also called to speak up. Because of my gifting, word wounds are especially hurtful. Some might receive them as a slap, I receive them as a gun shot. I spent way too much of my life keeping my wounding in from the built up shock after shock, internalizing my pain in the most self destructive ways. No more. As a daughter of the King, I deserve to treat myself better. First I run to my Abba, and let His balm, tears & love enfold me in His embrace. Then I allow Him to treat the wound: to cauterize, stitch, bind together the rawness left from the injury i have received. I then ask Him to give me His perspective on the situation. To see what He wants me to do, to speak what He wants me to speak, to forgive as He asks me to. Finally, only after the previous steps, do i approach the one who wounded me. Grounded in who I am, and secure in His embrace, I can speak up with confidence, knowing my Abba is with me, and my voice has value to Him. If you too are wounded today, draw near to your Abba. Put on some worship music, get comfy before Him, grab that box of Kleenex, pad of paper & pen, and let it all out. He will meet you in that pain, and begin the healing you & He are both longing for. Don’t keep using a bandaid to cover up your hurt. Allow the Healer to touch you, and make you whole again. Karla – Always blessed by your words. Thank you for sharing and for giving that gracious permission to feel hurt -I know all about internalizing form experience and sometimes that sense of “permission” to go before Him and just feel it and live it to get it healed is truly needed. Stopping by from Intentionally Pursuing!